No one really makes a fuss of your birthday once you become an adult, but I think birthday adventures are a must, no matter your age. This year, Heidi and I headed to Harrisburg to visit what I'm thinking is my future, a museum full of dolls! 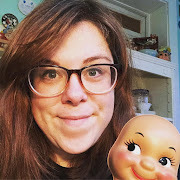 The Harrisburg Doll Museum was something I just stumbled upon online while searching for fun things to do and I am so glad I did. The museum is run by the sweetest lady. There's a small shop in the front and then the museum itself is split into rooms of a house, each housing different styles of dolls. There's also an ice cream parlor that can be rented for parties. If you are ever in the area, this place is so worth a visit! This is the first "room" of the museum and houses the oldest dolls in the collection. You can see two seriously adorable dolls in the mirror. Hehe! These dolls aren't typically my style, but I can certainly appreciate their beauty. The collection of mascot dolls was just amazing! I am so on the hunt for a Seltzer's Bologna doll for Heidi, after seeing it in this display. A lot of the fun for me was spotting dolls that I own and making mental notes of dolls to add to my collection. See the Nancy and Sluggo dolls towards the center? My grandma has the Nancy and I'm always on the lookout for the matching Sluggo. This is the ice cream parlor and it was filled with my very first doll love, Barbie. This room is filled with so many dolls I remember from my childhood. The bathroom was full of so many cuties! These are currently my holy grail of dolls, wooden Girl Scouts! I managed to find one old eBay listing online, but no luck finding any actually for sale yet. As if this place was meant for us, there was a whole display of Scouting dolls, you know I love all things vintage Girl Scouts, right next to a display of nun dolls, something Heidi collects and loves! Don and I celebrated our anniversary, way back in June, with a little day trip to the beach. I've always loved the drive there, lots of farms and little fruit stands and so many different ways to actually reach the destination. The GPS took us a new way this time and, when we passed the most lovely little brick church, I made Donnie turn around and go back. Isn't it beautiful? This is the Bridgetown Methodist Church. You can read about some of its history on this form from the Maryland Historical Trust and see a few older photos of the building. Many of the graves were too worn to be read. There were even some headstones in plant growing in the background. How's this for a final resting place?! It was so peaceful on the day we stopped and there was a wonderful slight breeze. The two headstones above belong to a married couple. From what I've found online, the weeping willow symbolizes mourning and grief. I'm always fascinated by the meanings of symbols used on headstones. This site has a pretty extensive list of symbols and their meanings. This sign in front of the church shows just how old this lovely spot really is! I'm spending this evening looking through old photos and listening to the playlist below, in hopes I can get myself into blogging. I really do miss it, but sometimes laziness wins. Fine, laziness almost always wins. I should probably cut myself a little slack, though. I work full time and I have two kiddos I like to hang out with and I have friends with whom I occasionally make plans. I do have time for other things I love, like blogging and creating, but most evenings naps and silly games on my phone win over those other things. So I just need to try a little harder and get a little better at distributing my time and, actually, this playlist is kind of doing its job. Spotify made this one for me and they did a good job of mixing new to me stuff with bands I already love, so have a listen and get some work done yourself!